Another big hinge for a first draft is hitting the magic 85. 85k worth of words. At this point, you officially have enough words to just stop. You’re long enough for a novel. Hurrah! But, of course, you don’t stop, because at 85k you’re probably nowhere near the end of the story. You are dealing with volume of words in novel writing, but you are also telling a story and I never know how long a story will take to tell, though I’m sure other writers do. So here, at 85k, I can pause again, look up from my desk and my appalling cup of tea and be assured that I have story enough for my novel. At 85k I’m roughly 2/3 through my story and there’s no stopping me now! 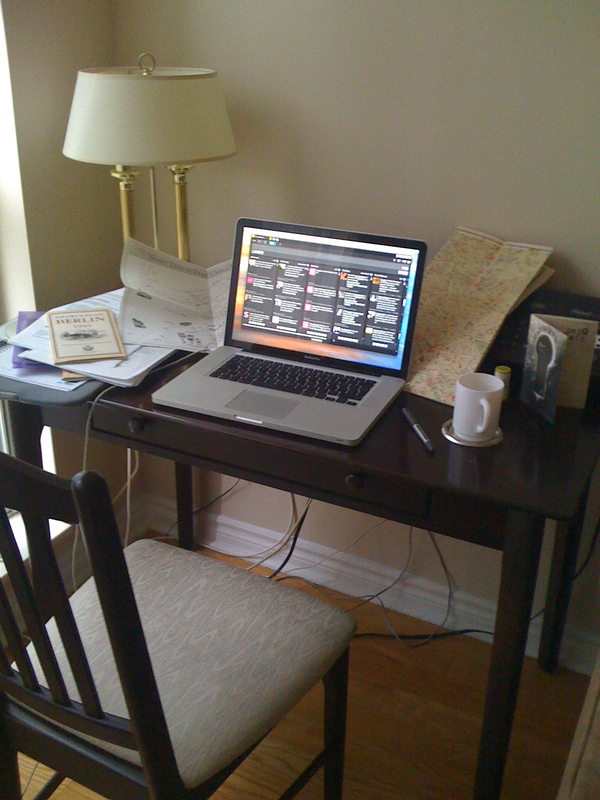 While I am still mindful of word count, to make sure I’m being productive at my desk rather than just noodling around, my new goal is to get to 1944 and Berlin by the time I leave this desk in Toronto and head back for my own desk in Whitstable. The countdown begins. Can I do it? Why not? You have to set a goal if you have any hope of reaching it. And if I don’t reach it, only I will know. Except, now I’ve told you, too. Oh dear. Today, I am sitting at another new desk. It’s still in Toronto. It’s even in the same building. But it’s a new flat three floors up and five doors over from the last one. The desk is much the same, so I’ll not trouble you with a picture. It’s blonde wood instead of dark and it still has a fax machine, a lamp, and a pile of paperwork. Still, it felt like moving, with all its associated upheaval. We have been living out of suitcases since November. So, what’s one more bout of packing? It truly makes you realise how little you need. Aside from my rather fetching new parka, the only things we buy here are groceries, so we packed those. We have pretty much been wearing the same clothes since November as well – sorry, Toronto – so we packed those, too. I stuffed the few books I’ve bought into my handbag and picked up the computer. It was easy to go, easy to arrive. I suppose I’m thinking about how little we need when we’re travelling, because I’m writing about people who are travelling. But whereas we can choose our circumstances – at the risk of libel I will say we moved due to neighbours who were under the mistaken impression that we were all sharing student housing – they cannot. The women interned during WW2 had one day’s notice, if they were listening to the radio at 1pm on 27 May 1940. Some women did, so they had time to pack and to worry. Others did not, particularly women who had been given a Class B in their Tribunal, which restricted their movements, placed a curfew on them, and dictated what they could not have in their possession, namely maps, cameras, and radios. For these women, the news was sudden. Pack one bag and bring your coat. It was hot in May 1940. Being asked to bring a coat had implications. The bag could be no more than one hundred pounds. As there were no porters for this move, I imagine women packed far more than they could carry. I would. They would then have to shed items, the further they had to walk. 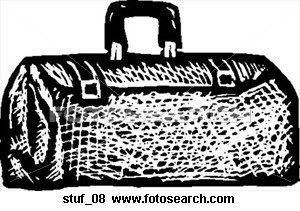 What would I have done with my one case, jammed full of books and nothing to wear for a stay that would last months? Years? I don’t suppose I would cope any better than the women did who became the internees of Rushen Camp in the Isle of Man. I interviewed several former internees while conducting research for a play about the Camp. This was several years ago, and I asked very different questions than I would now. I have piles of transcripts and recordings, and it is from these that I am picking my way through the story and creating my own, but there is no way to ask them questions, really. To do that, you have to go to the source. And years have passed. The camp has been closed now for 66 years. But sometimes, fate intervenes. I recently had a letter from a former internee, now living in Hamburg. Somehow, she found me, having moved away from London, having travelled since the end of last year. 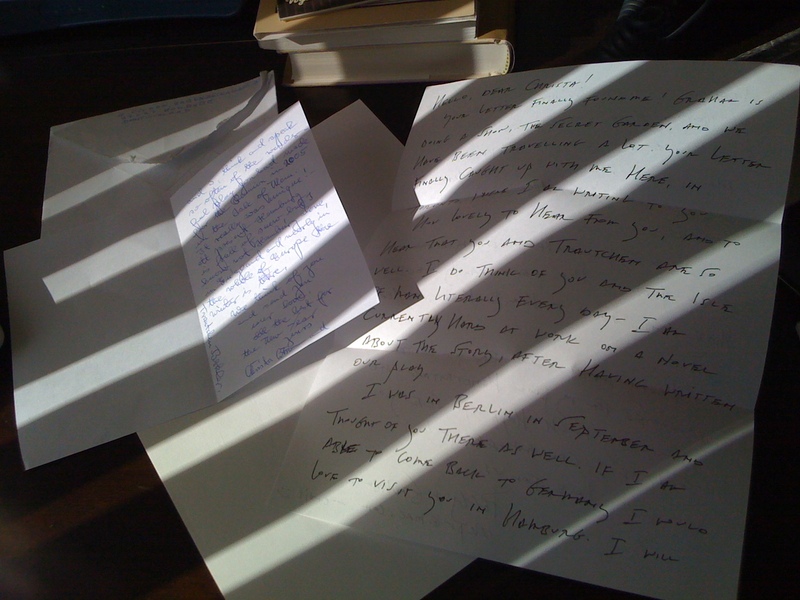 I quickly wrote her back – by hand, as I have no printer – and have to trust that she can read my scrawl when it says that I would love to see her. And so I would. Perhaps a trip to Hamburg is in my future. For there are many different questions I would ask her now. You never know where your research will lead you. You will know, if you read this blog, that my first novel is set in the Oklahoma Panhandle. I’ve never actually been there, but I won’t let a little thing like that get in my way. My second novel is set during WW2 in the Isle of Man and Berlin. I’ve been to both, lucky old me, but I haven’t lived through the war. That doesn’t stop me either but it just mean I hunt and peck facts on the internet. Sometimes, my two worlds collide, such as in this click, which led me to the Records of the Immigration and Naturalisation Service, INS. Or La Migra, as we called them back home. It was here I found a WW2 internment camp in Oklahoma, in Stringtown, Oklahoma. Stringtown is a small place in the southeast of Oklahoma. In the 2000 census their population was 396. 166 households. I don’t suppose it will have gone up for 2010. In fact, the population is steadily going down now that Stringtown can no longer raise funds by being a speed trap. 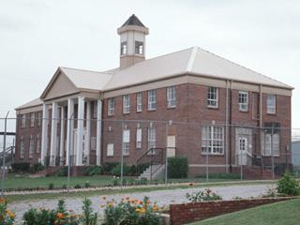 Its major employer, says Wikipedia, is the Mack Alford State Penitentiary, a spillover since 1933 to ease overcrowding at the Oklahoma State Penitentiary. It also served as an internment camp for mostly German men, though it did hold some Italians and Japanese, during WW2 with the same system of racial profiling that created the network of Japanese-American internment camps across the US as well as the women’s internment camp on the Isle of Man that is at the centre of my book. The nifty German American Internee Coalition provides information on internment camps. The photo comes from this site, as well as the information about how the camps were run. Apparently, the camp commander ran a tight ship. Attempted escapes were a cause for shooting. Internees were housed in the prison cells and sought to keep them “as clean as possible” as well as “engage in meaningful hobbies.” As with the women’s internment camp, “there was a small, vocal Nazi element at Stringtown, estimated to be less than 3% of the general population. This element had an unsettling effect on the atmosphere of the camp, especially for the few German Jews who were interned there.” Nazi women were about 10% of Rushen Camp at its opening, 29 May 1940, but as Jewish internees were released and more Nazi women moved to Rushen from Holloway Prison, the percentage was soon much higher. It is reported that two German internees died at the camp and are buried at Ft. Reno. Springtown was an internment camp for little more than a year. Then, the men were transferred elsewhere and the site was reserved for German prisoners of war, captured all around the world. Previously, Bonnie & Clyde started their crime spree from a dance hall in Springtown and afterward a tornado set down in the middle of town, destroying a community centre. Springtown hasn’t had an easy ride of it. But I’m glad to know about it, nevertheless. And as the birthplace of Reba McIntyre, it’s not all bad news. Unless you don’t like Reba. And then there’s probably not a lot to recommend it to you. So, we’ve arrived in Toronto, which you’ll know if you also follow me on Twitter. We arrived after a “big chill” of minus 27 and we are promised the next “big chill” is on its way. I am watching snow race diagonally across large picture windows and watching the man across the street spill salt from a little rolling cart onto the pavement. So that’s how they keep their sidewalks clear! I’ve already had a good old moan about not being able to pack books and so far it hasn’t mattered. I really have all I need here. A good solid desk with a lamp and a chair. My maps of Berlin at 1930 and 1940, and my handmade map of the Isle of Man in 1940, open and at the ready. A mug of tea, shamefully small. A pen. There is also a fax machine here, which is reassuring in an old-fashioned way. If a fax ever comes I’ll surely fly out this picture window beside me. I am packing again. This is a big pack, not a little pack. Little packs aren’t so hard. They say you’re going into London for a couple of days for work, or not work. They say you’re off on a small adventure. They say there might even be a holiday in the offering. Big packs are harder. They require consideration and selection. They require planning and imagination, ripe with the question: what will I want in February? In March? Clothes aren’t so hard. We only have so many extremities we need to cover in the pursuit of modesty. Even when the extremities will be subjected both to arctic snow and to southwestern sun, it is only a matter of choosing. Shoes are harder, but what girl wouldn’t say that? And shoes aren’t so heavy, an important consideration when the airline limits you to 20kg. No, what is hard is the books. The packing of books, which are heavy. The choosing of books, to just take one or two, say, which is nigh impossible. As I leap back into the first draft of my second novel, I know where I left my character and I know where she is headed. I know enough to get started and to get back into the writing. What I don’t know yet is what I don’t know. What will I need to know? What will I want to look up and to read? For the last pack I had a mighty basket of books for research. To be fair, I didn’t use many of them. Knowing they were there, I suppose, meant I didn’t panic over needing them. But what if they are not there? What on earth will I do? Just the thought makes me toy with packing only books – modesty be damned! But I will not be packing books, I guess. I will make what notes I can digital. I can photograph the prompts and props I have relied on. And what else? I can trust that, despite having books I have yet to read, I know enough already. I know enough to write this story right now. And anything I don’t know? Well, that can wait. Books will always wait for us to want them – need them – again.